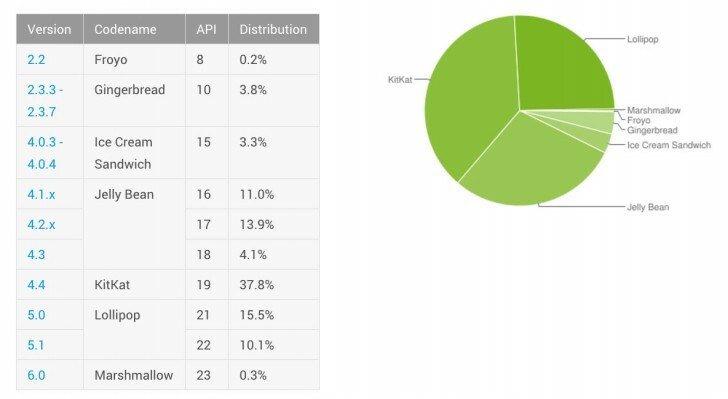 Back in September Lollipop finally went past 20% in Google's monthly Android distribution chart, and now, with the latest iteration of the report, Marshmallow is making its debut. Hopefully you weren't expecting the latest version of the OS to have a big impact already in terms of market share. Because it doesn't. It currently sits at 0.3%, which is just 0.1% past Froyo, a very, very old iteration of Android. But the good news is that it's there. And it can only go up from here, once more and more Android device makers start rolling out Marshmallow updates. Lollipop climbed to 25.6% of the market this month, a gain of more than 2% compared to the October data. Meanwhile, KitKat dropped to 37.8% from 38.9%, and Jelly Bean is now at 29% (down 1.2% from last month). The three oldest Android versions in the chart haven't seen much action over the past few weeks, with Gingerbread and Froyo still stuck at 3.8% and 0.2%, respectively, as Ice Cream Sandwich dropped a mere 0.1%. Older iterations of Android aren't part of the report because it uses data from the new Play Store app, which only works on Froyo or later. So true Muthu.. Dear iPhone worshipers, please stop supporting iOS whenever you find a text box to write comment..